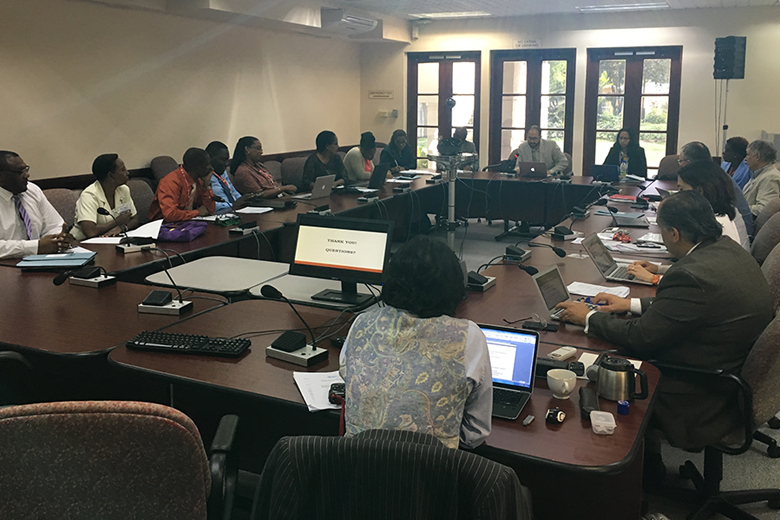 Meeting on Health Law: Implementing Fiscal and Regulatory Policies to Prevent Obesity in Children and Adolescents in English-Speaking Caribbean Countries (July 20-22). The goal of the meetings was to develop capacity to promote effective fiscal and regulatory policies. 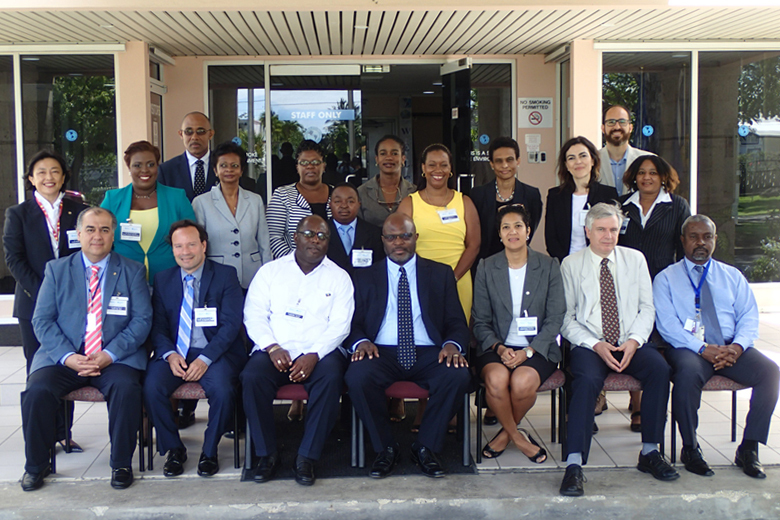 The meetings brought together a wide cross section of stakeholders from UN Women, UNICEF, UNFPA, UNDP, CARICOM, CARPHA, University of the West Indies (UWI), HCC, and senior Caribbean government officials from the Attorney General’s offices, Ministries of Finance, and Ministries of Health. 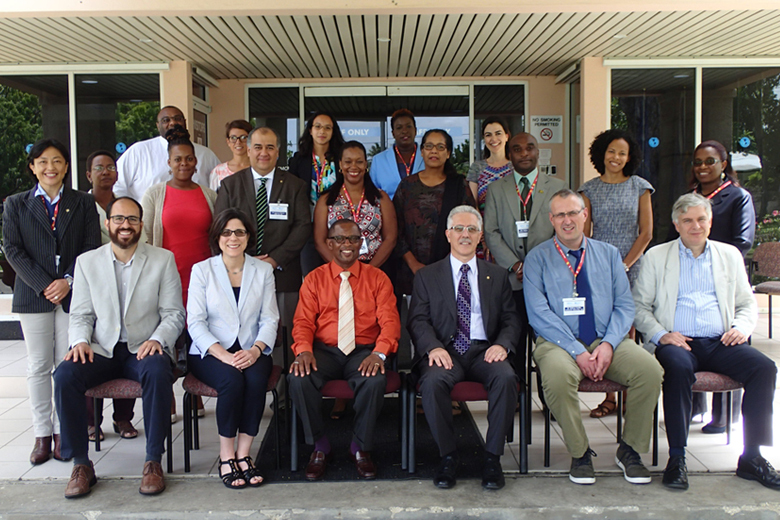 The meetings were led by PAHO ECC officials, Dr. Godfrey Xuereb and Dr. Tomo Kanda, and key technical advisors from PAHO Headquarters including Dr. Fabio da Silva Gomes, Dr Ignacio Ibarra, Mr Javier Vasquez and Dr. Elisa Prieto; and WHO Technical Advisor Mr Leo Nederveen. The HCC was represented by Policy Advisor Nicole Foster (who wore two hats representing UWI as well); Trade Policy Advisor Vincent Atkins (who also represented CARICOM Office of Trade); and Executive Director Maisha Hutton. The first meeting provided a unique platform for governments across the region to showcase national experiences in “Health Sector Legislative Reform”. The second meeting focussed on sharing of experiences and development of work plans to strengthen fiscal and regulatory policies to reduce overweight and obesity. The emphasis in this meeting was on: taxation of sugar-sweetened beverages (SSBs); marketing and advertising to children; and nutritional labelling. Two international experts shared their work. Dr Lisa M. Powell, Professor and Director, Health Policy and Administration, School of Public Health, University of Illinois at Chicago, spoke to fiscal policies with a focus on SSB taxation and advertising to children. Dr Jeffrey tramadol order cod overnight Collin, Professor of Global Health Policy Social Policy School of Social and Political Science University of Edinburgh, shared his work and perspectives on conflict of interest within the context of Big Soda and Big Food, informed by his experience working in tobacco control. The report will soon be available on the PAHO website.